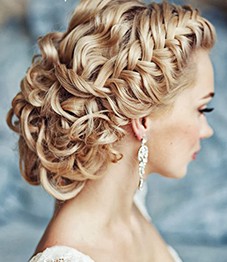 Bride & Bridal Party Services: During the hectic time of wedding preparations, Sublime Salon & Spa is your one stop resource for essential pre-wedding beauty preparation and wedding day services. We can customize a complete package utilizing all of our beauty services for hair, nails, skin and massage or anything in between. We have a dedicated Bridal Consultant who will help you develop a personalized pre-wedding and wedding day beauty program customized for your beauty needs and budget. For an exact quote on all services, it is best to contact our Bridal Consultant. - Parties of 8 or more with services provided at Sublime Salon & Spa will include a beautifully decorated table filled with complimentary breakfast goodies such as an assortment of bagels & cream cheese, bakery items, fresh fruit, coffee and orange juice. Bring the champagne and we’ll mix up the mimosas! - Packages available for spa days for the Bride and Groom or the Bridal party. Spa Days can includec manicures, pedicures, facials, and/or massage therapy.